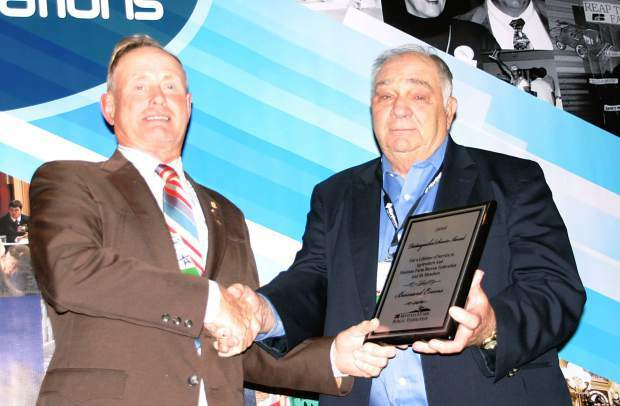 Dawson-Wibaux County Farm Bureau member Bernard Evans was presented with the Distinguished Service Award November 10 during the Montana Farm Bureau Annual Convention in Missoula. Evans and his late wife, Arlene, were active in both the state and county Farm Bureau for many years. Evans spent 13 years as president of the Dawson/Wibaux County Farm Bureau, six years on the Montana Farm Bureau Board of Directors, 11 years on the Montana Farm Bureau Budget Committee and four years on the Mountain West Farm Bureau Mutual Insurance Company Board. He also served for 11 years on the local school board and three years on the Dawson County Weed Board. "Bernard spent his life farming and ranching and has been dedicated to agriculture and Farm Bureau," said Montana Farm Bureau President Bob Hanson. "He was especially interested in working to eradicate noxious weeds, and developing solutions to environmental issues. We appreciate all his work over the many years we have known him." The Montana Farm Bureau Federation Annual Convention is taking place at the Hilton Garden Inn in Missoula, November 8-11. For more information on the convention and MFBF visit http://www.mfbf.org and follow MFBF on Facebook, Twitter and Instagram.